Citrine’s tangy name comes from its warm vivid color. Citrine is one of the most aptly named gemstones for its appearance. Hues of bright, sunshine yellow to umber in color are a part of the citrine family. Our citrine stones bring out their rich, luxurious quality and strength that might draw them closer to your heart as well. Citrine, a variety of the silica mineral , is a transparent, coarse-grained semiprecious gemstone known for its distinct yellowish-brown color. The gemstone has several ferric impurities, and is not often found naturally. Much of the citrine sold today is actually artificially heated amethyst or smoky quartz. Originally referred to as “yellow quartz,” the name "citrine" officially became the gemstone’s title as a result of German metallurgist, Georg Bauer, used the term in one of his gemstone and jewelry publications. The word "citrine" has several probable sources, though all are in reference to similar meaning. The most likely origin is from the old French word “citron,” which means "yellow." Another possibility is that it stems from the Latin word “citrus,” which refers to citrus fruits. During the 17th century, both citrine and smoky quartz were identified by the name "cairngorm" after being found in Scotland’s Cairngorm Mountains. Darker, more orangey-brown citrines (usually the most expensive) are called "Madeira citrine," as they are similar in color to Madeira wine. Citrine has been used decoratively in jewelry and on other in tools for thousands of years. During the Hellenistic Age in ancient Greece between 300 and 150 B.C., it started gaining admiration as an ornamental gem. In the 17th century, Scottish weapon makers used it to embellish handles of daggers and other weaponry, as it was believed to carry protection against venom and negative thoughts. In the Middle Ages, citrine helped treat people with depression while enduring long, unforgiving winter months. The Chinese considered it an aid for important parts of the body, including the heart, kidney, digestive tract, liver and muscles, which in turn encouraged individual creativity, improved internal clarity and dissuaded emotional self-destruction. Biblical scholars referred to citrine in the book of Exodus as the tenth of 12 stones in Aaron's breastplate. It was called chrysolitus (Greek for "golden stone") in the Old Testament, making it unclear if the stone was actually citrine, or if it was topaz or beryl. In Rome, citrine was very popular for making jewelry pieces, and gained similar popularity in the Art Deco period of the 1920s and 1930s. 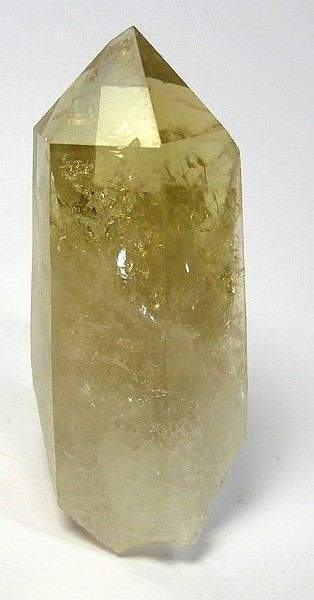 Member to the quartz family, citrine is silicon dioxide (SiO2) and is pyroelectric, meaning the it can shift its poles from north to south, and back again. 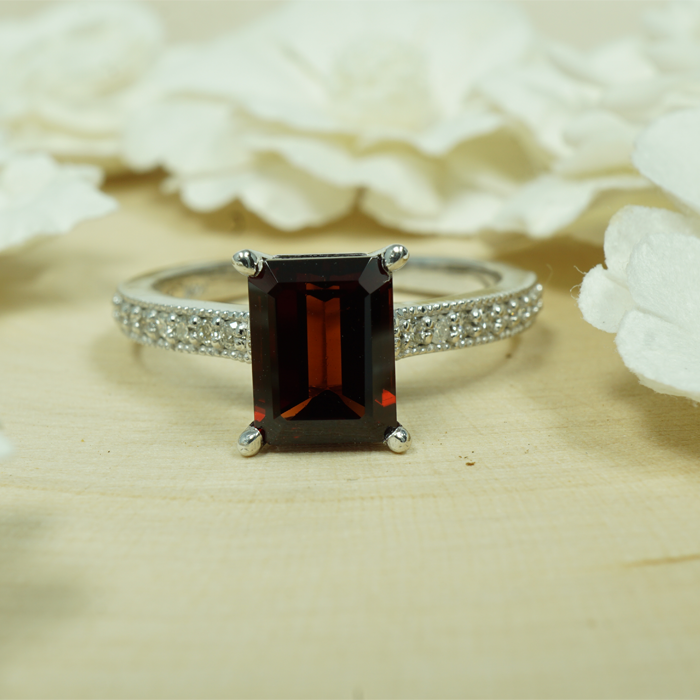 It has a hardness of 7.0 on the Mohs scale, which makes it one of the more durable gemstones. Citrine is formed primarily in projecting clusters on a geode base as short, pointed crystals. It is either singular or in drusy aggregates, and can sometimes form in massive, crusty crystals. Often mistaken for topaz, citrine gets its unique color from colloidally suspended hydrous iron oxide. It can, however, be clearly distinguished from its lookalike by looking for its inferior hardness. The most prominent, natural deposits of citrine are located in Brazil. Other localities include Argentina, Uruguay, U.S.A., Namibia, Kazakhstan, Madagascar, Myanmar (Burma), Namibia, Russia, France, Scotland and Spain.